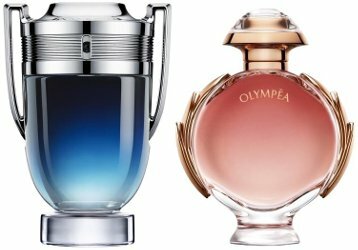 Paco Rabanne has launched Invictus Legend and Olympéa Legend, new limited edition flankers to 2013's Invictus fragrance for men and 2015's Olympéa fragrance for women. Invictus Legend ~ "At the frontier of time, a new land. Vast. And new challenge, immense. Burning desert heat. Motors roar in convoy. Ambush, counter-attack, acceleration. Invictus triumphs effortlessly and speeds towards glory. Invictus Legend. A blazing duel. Two forces clash. Fresh adrenaline rides a whirlwind of hot woods. A fragrance with power. Thrilling like victory." In 50 and 100 ml Eau de Parfum. Olympéa Legend ~ "A modern day goddess. Heaven-scent. Iconic, chic. Unique. Half-myth, half-muse. Smiling on victory as her natural reward. Ready to seduce Zeus. Trouble in paradise... A sensuel [sic] salty-vanilla, earthly, irrresistible." In 50 and 80 ml Eau de Parfum. Looks like “sensual” might have been misspelled by Paco Rabanne in the Olympea blurb.